Years after Kernan Ronan played for him, Ronan's high school coach Dave Grant told NAUAthletics.com that he saw good things with Ronan. "Kernan, even at that time, had great expertise and potential when it came to knowledge of pitching," Grant told the site. "I told him that an opportunity for a full-time position in pro ball is something he shouldn't pass up. Major League teams are always scrutinizing the development of their players, so the fact that he's been there so long says a lot about his ability to coach." Ronan played in the pros for five seasons, started out of Northern Arizona University. He made AAA, but not the majors. 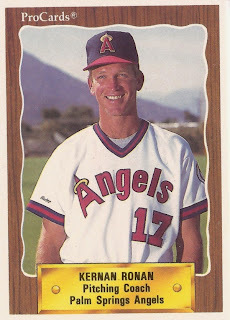 His playing days over, Ronan went on to a long career as a coach in the Angels system. Ronan's career began in 1981, taken by the Giants in the 18th round out of Northern Arizona. Ronan started with the Giants at rookie Great Falls. He went 3-6, with a 5.32 ERA. He made AA Shreveport for 16 outings in 1982. He then played all of 1983 at AAA Phoenix. He picked up a save in a June game. He played two more seasons with the Giants, both at AA Shreveport. By 1990, Ronan was back in the minors, coaching with the Angels at high-A Palm Springs. He coached 1991 at AA Midland, largely staying there through 1996. In 1998, he was coaching at high-A Lake Elsinore. He told The Los Angeles Times about transitioning college pitchers to pro pitchers. "The biggest thing is to get the college pitcher to learn to throw inside," Ronan told The Times. "He works away, away, away, because he knows that if he makes a mistake with the aluminum bat, the ball is going to be hit a long way. Here, he can throw an inside fastball and break the wood bat." Ronan continued with Lake Elsinore through 2000. He then coached at rookie Provo and single-A Cedar Rapids. He became the Angels' roving minor league pitching instructor in 2007. In 2006, he watched over Angels prospect Nick Adenhart as pitching coach at Cedar Rapids. "I knew he could pitch," Ronan told MiLB.com. "He has great stuff, and quality to above-average pitches, and he's done what he's capable of doing at this level, without a doubt."